After trying a lot of different approaches, I am now getting close to the results I want when photographing teapots. I figured it would be worthwhile to share my system in the hopes that it’s helpful to someone else, and with the idea I might get some suggestions from others. A clean image that shows detail of the piece. An image that’s reasonably accurate in color reproduction. An image that gives a little drama to the piece, rather than a cold, clinical look. I’ve tried several approaches. The one that I find best (so far) is not the cheapest approach. It involves about $300 in lighting equipment, not including the cost of any photographic gear. I started with a kit from Table Top Studios. 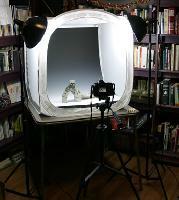 It included a 30″ light tent and a two-light set. I bought a graduated backdrop from another photographic supply house, which I needed to trim to size — Table Top Studios now sells a custom sized backdrop which seems to be ideal. One other word of praise for Table Top — I was facing a deadline, when one of the bulbs burned out. They were extremely helpful and overnighted me a free replacement, so I was able to make the deadline. That made me a loyal customer from here on out. I set up the tent on a card table in the overstuffed Meier Quagg Library. I installed the nylon sweep, and used clothespins to fasten the graduated backdrop to it. Because the light tent has a lip, I raised the front portion of the sweep using the two-volume Oxford English Dictionary. The 1982 version is perfectly sized; you might want to use something else of the same general shape and size. Before placing a teapot upon this stage, I metered off of an 18% gray card, oriented vertically. Then, I tried it with a teapot. I did a lot of experimentation, bracketing, spot-metering, etc, and, to my simultaneous delight and dismay, found that for both digital and film, Nikon’s Matrix Metering was spot on for the best exposure. To get the best images, I stopped down to f/11, which necessitated a fairly long exposure time (on the order of a quarter second), which, of course, makes a tripod all the more necessary. I did more work on War Widow this evening. She’s made with a marbled layer of assorted clay slips, supported on a base of white clay (Laguna B-Mix with Sand). The bones all started as extruded tubes, which were then manipulated and sculpted. She’s really shaping up nicely, although her face is fairly androgynous. Especially with heads coming from my slump molds, I am still struggling with the subtleties of feminine faces. Older male faces happen easily; feminine or young faces are still somewhat ambiguous. Even though I’ve been working on it for about six months, I’m still in that excited, “hey this is great!” stage with my new teapot series. Usually, by this time, my enthusiasm has run out, and I’ve fallen into the depths of blackest despair over the general unworthiness of the project in question. This series is based upon the shape of human heads. The inspiration has its genesis in teapots I did years ago, but got rekindled with Joey, and then later Sylph from last year. The current series is less about pure representation, however. The first in the series, Identity Politics is online (although I’m not happy with the photography. I’ll probably reshoot this.) Recently out of the kiln, but not yet photographed, is Gabba Gabba Hey, which is a commentary on cell-phone culture, and Time of Your Life which is a simple summary of a life. Most recently, Hope has been bisqued, and Paranoia / Homeland Security is ready for the bisque. These two both involve modified or sectioned head forms, and I’m really pleased with both of them thus far. Last night I started work on War Widow, which will return slightly towards the more representational. Pictures will be posted as they get completed.